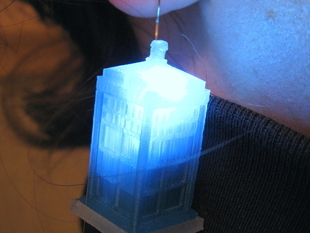 Two modifications of Tardis earrings, one with internal LED and clear beacon, and one with LED projecting through roof to replace beacon. Decided to make new battery supports to allow variations in design. #371 batteries. Enlarge to 113.4% original size to provide clearance for the batteries. These are fantastic mods! If you are willing, I highly recommend you share your files. TARDIS items are beloved and many people keep asking me to make the adjustments to the glow earrings that you've taken the time to do. If you want to share the files, go to "Create --> Upload a Thing" at the top of the website. Creating a new Thing always gives you the opportunity to acknowledge any work that came before by checking "This is a remix" and then searching for as many pre-existing Things as you used to create your special creation.